After spending three weeks in January gorging ourselves on delicious food in Thailand, I had high expectations for food in Cambodia. Unfortunately, I've been mostly underwhelmed. There have been some bright and shining stars in the last two months, but overall, the Khmer food I've had has been just fine. Nothing bad, but not much in the "to-die-for" category. Come to find out that Khmer recipes go back to the days before the introduction of the chili in Asia, so the dishes are milder than most Asian food. That could be part of it. When some fellow volunteers said they were taking a Cambodian cooking class, I was a little skeptical. But sticky rice with mango was on the menu so I thought, why not? There are surprisingly very few cooking classes in Phnom Penh compared with places like Siem Reap to the north and Chiang Mai in Thailand. 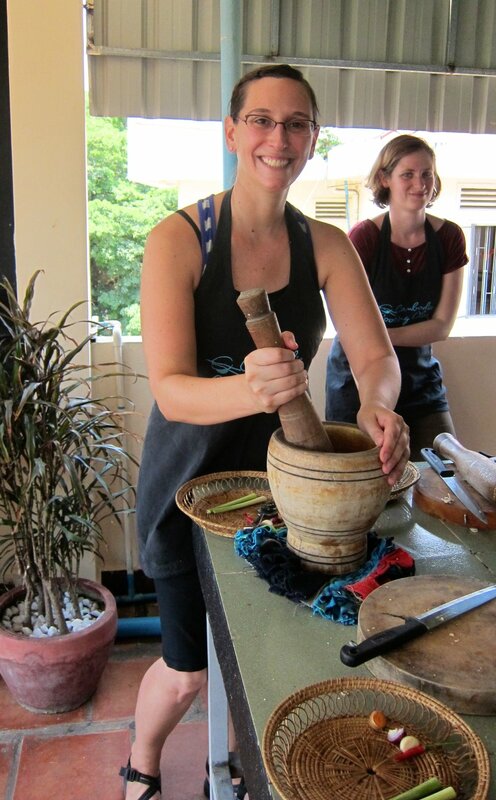 Cambodia Cooking Class runs both a half and full day cooking course in the city, administered out of Frizz restaurant near the Royal Palace. 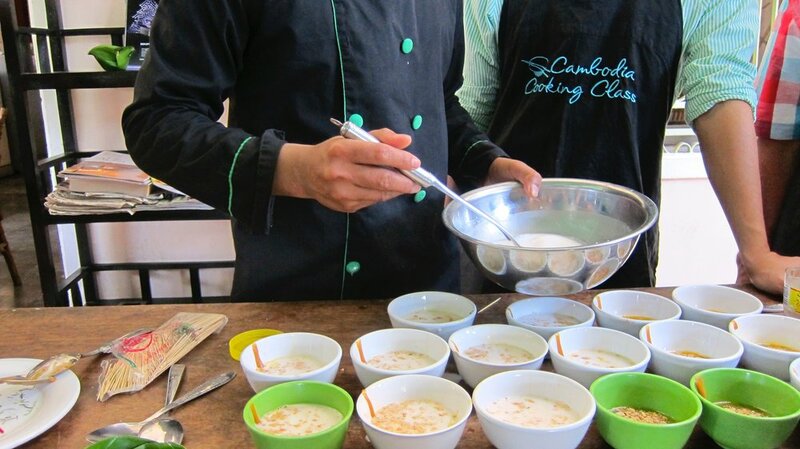 Cambodia Cooking Class in Phnom Penh. Our instructors, Sorn and Kong Kear, greet our group of 16 at the restaurant shortly after 9 a.m. They are bubbly and engaging as they tell us about the day ahead. Our first stop is a market near the riverfront, just north of Frizz. Sorn takes our group through the stalls telling us about fruit, noodles, seafood, vegetables and meat. We pass women in galoshes hacking away at fish with cleavers and stall after stall of yellow and green mangoes, one of the only fruits here that are easily identifiable based on my U.S. roots. If there is one thing I've loved about Cambodian food, its the plethora of fruit. Jackfruit, mangosteens, tiny bananas, mangoes, coconuts and plenty others I cannot recall by name, only taste. A Cambodian fruit lesson at the market. A tuk tuk takes us south to another neighborhood where we walk up two flights of stairs to the open-air terrace kitchen. A long island of burners and cutting boards await our group and we gather around Kong Kear for our first lesson in carrot and taro root fried spring rolls. The taro root gets shredded, soaked in water, wrung out, doused in salt, rinsed and wrung out again before it's ready to be spring roll filling. It's added to the carrots along with peanuts, and we wrap our rolls up tight before dipping them into the hot oil. Kong Kear shows us how to make a simple sweet and sour sauce as we wait for our first dish to cook. Fried spring rolls with sweet and sour sauce. The morning continues with the long and arduous process of making Cambodia's most famous dish - fish amok. Amok is a Cambodian curry, which is steamed in banana leaves. It starts with a base of Kroeung, a mixture of chili paste, garlic, galangal, lemongrass, tumeric, kaffir lime zest, salt and peanuts. The group pounds away with mortars and pestles and we get into a rhythm with Kong Kear yelling at us to pound harder. Pounding away at the Kroeung. We add a sauce to the Kroeung and combine with the fish before putting the entire mixture into our banana leaf cups. My homemade cup is a little on the flimsy side and my sauce starts to drip out the moment I put it in the steamer. Luckily, it solidifies quickly and my amok stays in the cup. My oddly shaped banana leaf box of fish amok. We reach the halfway point in the day and the majority of the group says their good-byes. They get back into tuk tuks leaving only five of us for the afternoon portion. Sorn takes over the lesson in the afternoon and I'm grateful for more one-on-one instruction with the smaller group. Sorn talks us through peeling the large purple banana flower, only to reveal the small inside that we'll use for a banana blossom salad. This has been one of my favorite dishes in Cambodia so I'm excited to learn how to cook with the banana flower. She asks if we can get it in our home countries (U.S., Germany, U.K. and Denmark) and we all sadly shake our heads no. Demonstrating how to peel a banana flower. The banana flower slices get combined with a mixture of basil and mint along with chicken and a dressing of the sweet and sour sauce from the morning. It's delightful, refreshing and so satisfying. 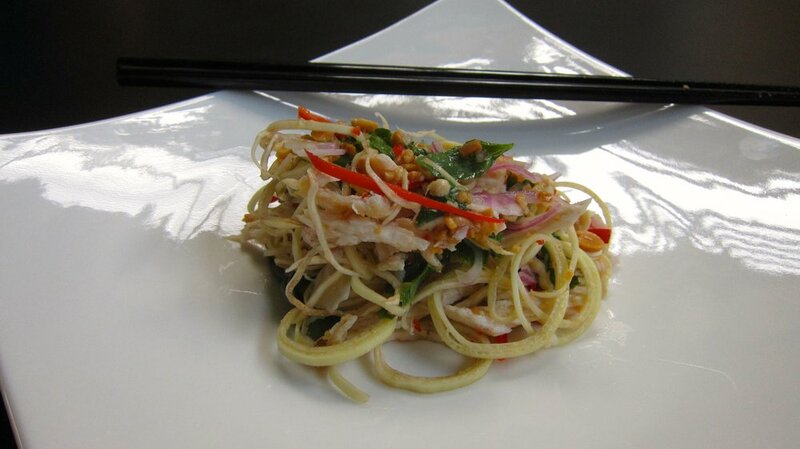 Banana blossom salad with chicken. For dessert, we spend the next 20 minutes drooling over the thought of sticky rice with mango. Sorn shows us how to effectively cut a mango (finally!! see below for my newly acquired technique) and we make a caramel sauce out of palm sugar. Grated coconut gets added to the caramel sauce and we plate our rice, mango and sauce for our final meal of the day. Sticky rice with mango and caramel sauce. As with most cooking classes, the food we made ourselves is far better than what I've had in some restaurants here. At $23 for a full-day class, complete with a four-course meal, it would be hard to turn down the opportunity to attend. In a city like Phnom Penh where the tourist circuit is rather short, this class is a nice addition. As for my Khmer cooking skills? I learned a decent amount, but may be hard pressed to find all the ingredients for a full Cambodian meal back in the States. My friends and family just may have to come to Cambodia to try fish amok, banana blossom salad and sticky rice with mango. I promise those three dishes won't disappoint. For anyone debating between the half and full day, commit to the full day. The class size is so much more manageable in the afternoon and the class only runs two hours longer. Bon appetit! 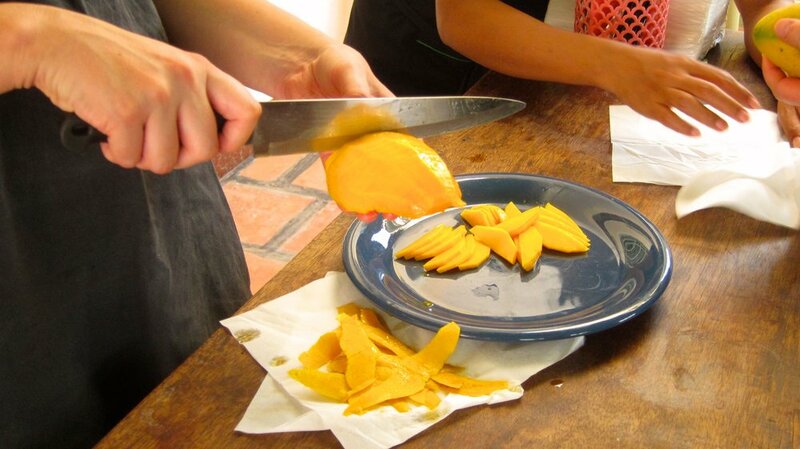 Learning how to cut a mango.